Best: vs. TCU at Arlington, Texas, Sept. 15. Kudos to the Buckeyes for scheduling two Power Five opponents (Oregon State is the other) in their nonconference schedule. The Horned Frogs went 11-3 last year, played in the Big 12 title game and won the Alamo Bowl over Stanford. But TCU lost eight starters on offense, so it’ll lean on its usually reliable defense. The Horned Frogs have enough talent to hang with the Buckeyes, who’ll be breaking in a new starting quarterback. Worst: vs. Tulane, Sept. 22. The Green Wave is coming off a 5-7 season and is projected to be a middle-of-the-pack team in the American Athletic Conference’s West division. Best: at Pittsburgh, Sept. 8. There’s never been much love lost between the Nittany Lions and Panthers, so what better reason to play annually for Western Pennsylvania supremacy? Unfortunately, the four-year contract ends after the 2019 meeting, and it doesn’t appear as if the sides will renew the series anytime soon. The Nittany Lions should have the edge this year, but their last visit to Pitt in 2016 ended with a 42-39 loss. Worst: vs. Kent State, Sept. 15. The Golden Flashes went 2-10 last year and are expected to be MAC also-rans again. Best: at Arizona State, Sept. 8. For curiosity’s sake, this Spartans-Sun Devils matchup is a must-see. Arizona State’s new coach is Herm Edwards, who the former Jets and Chiefs coach who hasn’t coached in college since 1989. Will the unconventional hire work? That will take time to determine, but a visit from a veteran Michigan State team that figures to be in the top 15 in preseason polls could be a good early gauge. Worst: vs. Central Michigan, Sept. 29. The Chippewas were 8-5 last season, but they lost their quarterback and the bulk of their defense to graduation. Best: at Notre Dame, Sept. 1. This is another rivalry that college football fans deserve to see annually, but this will be the first meeting since 2014, because the Fighting Irish exercised an opt-out clause. 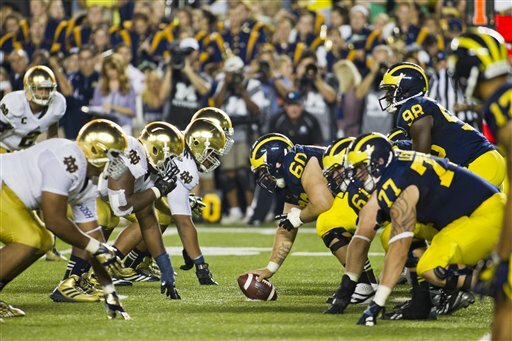 The Wolverines and Irish are scheduled for the next two seasons, and there have been discussions about extending it. As for this year’s season-opening matchup, Michigan enters with a ton of promise in quarterback Shea Patterson, a transfer from Ole Miss, and a veteran defense led by linebacker Devin Bush and ends Chase Winovich and Rashan Gary. Worst: vs. SMU, Sept. 15. Sonny Dykes takes over as coach of the Mustangs after Chad Morris left for Arkansas. Their trip to Michigan comes a week after they play TCU, so a rough start could be in the works. Best: at Kansas, Sept. 15. It might be a bit of a stretch to call Kansas the Scarlet Knights’ best nonconference opponent, since the Jayhawks are 3-33 in the past three seasons. But at least they’re a Power Five opponent. Worst: vs. Texas State, Sept. 1. The Bobcats are coming off back-to-back 2-10 seasons, and they’re expected to be a Sun Belt also-ran. Best: vs. Virginia, Sept. 8. The Hoosiers defeated the Cavaliers 34-17 last year in Charlottesville, and having the home-field edge should be enough to top a rebuilding Virginia team. Worst: vs. Ball State, Sept. 15. The Cardinals should improve on their 2-10 record in 2017, but the Hoosiers have enough talent to avoid an upset. Best: vs. Texas at Landover, Md., Sept. 1. The Terrapins showed off an explosive offense in a 51-41 shootout victory over the Longhorns in Austin in last year’s opener. A slew of quarterback injuries, however, doomed Maryland to a 4-8 mark. How much better will Maryland be with a healthy QB, and how much better will Texas be in coach Tom Herman’s second year? The opener will provide some answers. Worst: at Bowling Green, Sept. 8. The Falcons beat the Terps 48-27 in 2015, and now Maryland must make the trip west to face a team that went 2-10 last year. Who's feeling the heat, and who's not, among Big Ten football coaches?